Ladakh is open for tourists throughout the year, while the best period for the cultural tour is between April and October ending. For adventure tours June to October is the suitable period. Most of the trekking routes are closed after November due to snow at high passes except the Liker to Khaltsey trek. 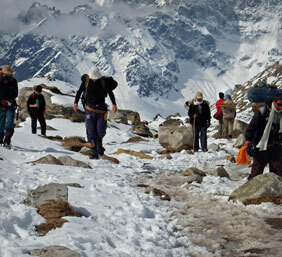 The best period for Chadar-trek (frozen river trek) to Zanskar is from January to mid-March. The festivals of Stok, Matho and New Year take place in winter and it is possible to visit monasteries in winters. There are few hotels and guest houses with heating facilities in Leh that provide accommodation in winter. Ladakh is spread over an area of 97,000 Sq. Kms and lies on an average of 3500 meters above the sea level. Ladakh has a population of around 1,70,000. The local currency is Indian Rupees. There are authorized agencies for money exchange for USD or Euro traveler cheque and cash. You should insist for a receipt, which will help you in reconverting the money whenever you desire. Credit Cards are accepted by major Travel Agents, hotels and antique shops on paying 2.5% service charge. The Indian Standard time (IST) is as per the calculation done in the Allahabad city. IST is 5 hours and 30 minutes ahead of London, 4 hours and 30 minutes ahead of Paris and about 10 hours and 30 minutes behind the New York City. The Indian airlines, Jet airways and Air Deccan operate regularly between New Delhi to Leh. The Indian Airlines has its flight operates twice a week between Leh and Jammu. It also operates Srinagar-Leh once in a week. Jet airways and Air Deccan flights operate only between Leh and Delhi. The Srinagar Leh road remains open from early June to November. And the Manali-Leh road remains open from early June to mid–October. The temperature in mid summer is pleasant requiring T-shirt and shorts in the daytime but in evening temperature drips and you need jacket or pullover. While trekking above 4000m, you need warm cloths. Sometimes there is rain or snow in early June and August. Therefore, you need wind sheeter or raincoat. Good waterproof shoes are needed while trekking and extra Pair of shoes or slippers is useful while crossing the rivers. Two ruck sacks are needed. One small handbag for your camera, water bottle, pack lunch and a space for jacket. Bigger one to carrying clothes with extra layer to be safe from rain and dust. Summer sleeping bag is enough if you are travelling between mid June to mid September and warm winter sleeping bag is required if you are travelling between mid September to mid June. You can also rent very good sleeping bags from trekking companies in Leh. Acute mountain sickness can occur to any one at an altitude above 10,000 ft. above sea level, therefore, make it sure to take complete rest on the day of arrival. There are hundreds of family run hotel and Guest Houses in Leh to suit every pocket. All the hotel and restaurants serve Local Ladakhi, Tibetan, Indian, Chinese, Italian and continental cuisines. Generally there are no street hawkers in Leh Town, but at time you might come across people in the street trying to lure you to their shops. You should discourage such practices, it may cause inconvenience to you later. Telephone & Fax facilities are available in Leh, Padum, Kargil and Nubra Valley. Foreign airmail rate is Rs 15 for a letter,which is not exceeding 20 grams in weight for Australia,Japan,Europe and America .For aerogramme Rs 8.50 and Post Card Rs 8/-. Internet and e-mail services are available in the Leh town. it would be advisable to ask before clicking a picture of individual or even group of people. However, a tourist should refuse to give money if asked for. It would be convenient to carry a water purification set with you on a trek. It is even safe to use boiled fresh water during the trek. The Dzomsa Laundry in the main market sell high pressure boiled water for Rs 7 per liter. You can bring your water bottle or container to get it filled with the chemical-free safe drinking water at the Dzomsa Laundry. Ladakh is perhaps the only region in India where the use of plastic bag is officially banned. So, the plastic carry bags that you see in other parts of India are not seen in Leh. However, market goods in readymade plastics packages are there. A trekker should ensure that the biodegradable camping wastes are buried properly and burn the non biodegradable ones before they move further. All the trekking routes fall under the sensitive wildlife habitat area including the Hemis National Park. In fact Ladakh is a place where villages are part of the vast wilderness that harbours rich but sparse wildlife. Some of the species are even endangered ones. Therefore, one should be extremely careful about not causing any disturbance to the vulnerable wildlife habitat while on trek. Hired taxis from outside Ladakh are not allowed to be used for local sightseeing and jeep-safari. You can book the non-local taxis only to drop you at Leh or for your return trip while leaving Ladakh. You have to hire local taxis for local sightseeing and jeep safaris. However, there is no restriction for those traveling in their own private cars.